After Hearts’ 4-0 thumping of Celtic in mid-December, the first domestic defeat inflicted on Brendan Rodgers’ side in 69 games, many onlookers thought that Craig Levein’s high-pressing would create a blueprint for others to follow. Celtic disposed of Partick Thistle, Dundee and Aberdeen comfortably enough in their next two games but the Old Firm game on the eve of Hogmanay presented Rangers manager Graeme Murty with a dilemma. In his first derby match in March he managed to nullify much of Celtic’s threat by employing a medium block, but while some similarities remained the same, this was a bolder set-up. Given the number of crucial players unavailable including central midfield pairing, Ryan Jack and Graham Dorrans, captain Lee Wallace and most experienced player Kenny Miller, the options at Murty’s disposal were limited. Rangers have looked most effective in a diamond midfield but with just Ross McCrorie and Jason Holt realistically able to carry out the workload involved, Murty switched to the 4-2-3-1 again, with Josh Windass moving to his less favourable left wing role. Kristoffer Ajer retained his place at the heart of the Celtic defence and provided much needed composure on the ball, but Rangers were very deliberate in their attempts to funnel Celtic’s build-up play through central areas by pressing high. Rangers pressing & Celtic build-up. When the ball was played back to Dedryck Boyata or Ajer from the full-back, Alfredo Morelos arced his run to press from behind and cut off the square pass to their defensive partner, while Windass and Daniel Candeias applied tight pressure to deny the return pass. 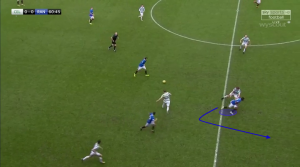 This forced the play into central areas and was key to the success Rangers had in limiting Celtic early on. It is well documented that Celtic play with a lop-sided structure when building up as Tierney pushes on high with Lustig tucking in to create a back three to give balance, but that has been tweaked in recent games to represent a more conventional set-up. Lustig has struggled defensively in most of the recent Old Firm games when up against Barrie McKay, but the Swede is also less comfortable in possession that Tierney. Rangers identified this and so positioned Candeias higher than Tierney in a screening role to stop the play being directed through him. The Scot never came inside to a more central role to counteract that nearly enough, however. 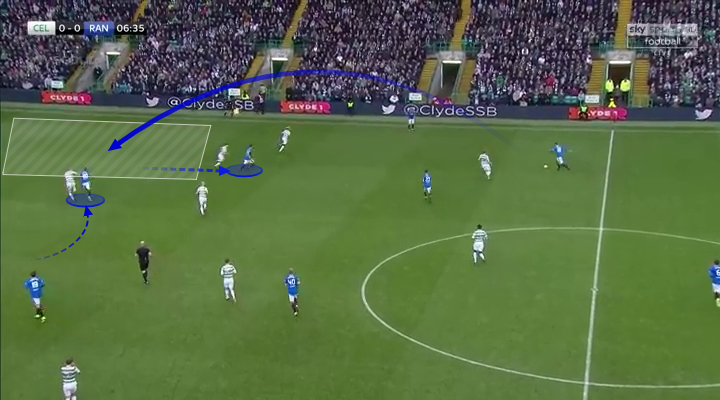 On the other wing, however, Rangers welcomed the ball into Lustig who has a bad habit of receiving the ball with his body at a 45 degree angle facing his own goal. This negative position allowed Rangers to press as soon as he took his touch backwards and was a common theme of the success Rangers had when pressing. Lustig gave the ball away twenty times throughout the 90 minutes and often resorted to hooking the ball with his left foot due to a lack of options, often a self-imposed situation. The ball from full-back to winger was outright denied throughout, so the ball into central midfield was usually the pattern, but in McCrorie Rangers had a player who had the athleticism to drive McGregor away from dangerous areas upon receiving a pass. As soon as a pass was played into the feet of a Celtic midfielder who had their back to goal Rangers pressed, as they also did whenever the play moved from the final third back into the middle of the park. Rangers maintained a compact shape with both full-backs playing very narrow to deny space between them and their centre-halves. Holt and McCrorie were also diligent in their duties as they reacted to Celtic’s rotation well to block passes into feet. The difficulty Celtic faced was that, while Ajer is a ball-playing centre-half capable of striding out of defence, Boyata is someone who teams actively encourage to maintain possession as, when faced with no obvious passing options, he is prone to forcing passes that aren’t there. Morelos split the defenders but was closer to the ball-side one, which allowed Ajer to step in front and receive the pass to break the pressure, but not regularly enough. 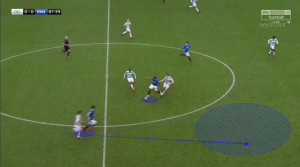 When the ball went back to Gordon, Morelos blocked the pass back to where it had come from and Candeias pushed on to make the pass to the other centre-half a precarious one. This left Tierney free and invited Gordon to play the diagonal ball, but Rangers had clearly earmarked this is a potential situation from which they could spring the counter attack as Gordon has a tendency to hook his distribution at those ranges. Tavernier edged forward so that he was in a position to challenge Tierney in the air, a duel in which he would dominate in most cases, with Bates shifting across to cover Sinclair. Celtic varied their structure when building up in their attempts to have controlled possession through the thirds. Rodgers has been able to make changes to solve these problems virtually whenever Celtic have been less than fluent. They did find a number of fleeting solutions but nothing that posed a concrete remedy to make Rangers rethink their plans. Celtic struggled for control in the opening 15 minutes as Rangers tried to stop their attacks at source by pinning Kranjcar on Brown but he didn’t have the intensity levels to maintain this. Celtic were able to break the structure when Candeias pressed Ajer from wide by simply bouncing the ball into Armstrong who swept it wide to Tierney, the spare man. Holt had to press the right side of the midfielder’s body in order to force the play left but Murty was probably been content with the gamble of hedging his bets on robbing the ball high up the park, as the supporting line shuffled across well to deny a clear space to break into once the ball arrived at Tierney. Celtic managed to pierce through the heart of Rangers’ defensive structure after a quarter of an hour when Rangers were forced into defending as a 3-5-2 and Celtic morphed into a two-man attack. Armstrong instructed Tierney to push higher up the park so that he could drift into a left-back position to pick up the ball, a feature of the first-half as it progressed. Sinclair then moved into a central striker position alongside Dembele. As Candeias was still pre-occupied with blocking Celtic’s attempts to play around the block, he maintained a wide position in front of the full-back. This meant that Tavernier was forced to pick up Tierney as Armstrong was now in Candeias’ zone. McCrorie tracked Sinclair as Rangers wanted the insurance of a third body against the pace and power of Sinclair and Dembele. Rangers still maintained a one man advantage in this area of the park but, as it was a 3v2 rather than a 2v1, it meant that there would be larger spaces in the midfield area. 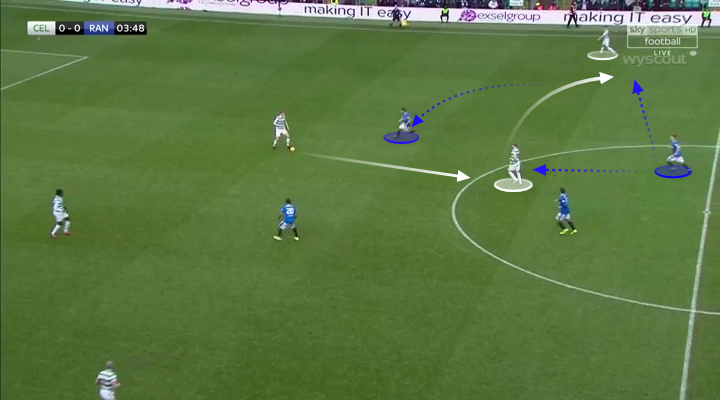 The negative of using a man-orientated system to hound a team’s playmaker is that if someone with Brown’s now autonomous understanding of how to manipulate pressing traps identifies that there is a lack of a space in the centre, then by simply vacating it he can open up a huge gulf. This is what happened here as a simple bounce pass back to Ajer left a hole in the middle of the park in which Armstrong was able to drift into. Brown again varied the structure as Celtic attempted to devise a way in which Armstrong and McGregor could influence the game. This time the hoops captain dropped back to form a back three for the first time on the 27th minute, as his composure would help play from deep. The negative of man-orientated marking means that by simply vacating the space Brown dragged Kranjcar away and opened up a gap to isolate pairings like Armstrong v Holt, which strongly favours the Celtic player if he has space in which to express his athleticism. It also opened up passing lanes to Dembele and gave Celtic the option of going more direct to escape the press, as he could drop deep and take Bates into uncomfortable areas of the park. Celtic didn’t get enough players supporting the forward though so his hold-up play was often constrained to playing back to where the pass came from. 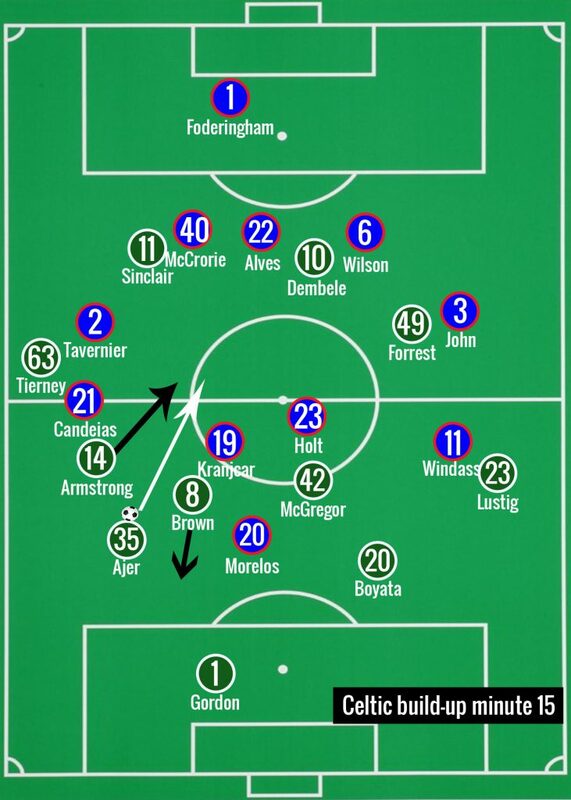 When Armstrong dropped into the left-back position, Tierney pushed on very high, with Sinclair and Forrest occupying inside forward positions. Trapping Tavernier in a deep position would be important in stopping the catalysts of the majority of Rangers’ attacks when in transition. But the biggest positive the change in positioning during possession was how Celtic’s midfielders were able to receive the ball higher up the park with a more flexible body position. As stated, the Celtic wide players tucked inside but when Brown dropped behind the ball Ajer’s forays into midfield delved deeper now that Kranjcar was alongside Morelos. After the bright start by Rangers, Celtic began to assert their dominance on the game when Armstrong and McGregor invited Boyata and Ajer to dribble forward with the ball and backed off themselves tp give them more room. They made in-to-out runs where the diagonal pass was safe-side and with enough weight to allow to run through their bodies. They were then in a position where they were facing the Rangers goal and could make positive decisions rather than being under pressure receiving the ball deep facing their own box. Boyata also took the decision to sometimes step up higher than Lustig when he played the ball wide, with the first example coming in the fourth minute when the return pass to Lustig was intercepted and nearly led to a goal. On the 41st minute Lustig received the ball from Boyata in a central position with the Belgian following his pass and ending up higher and wider than Lustig. 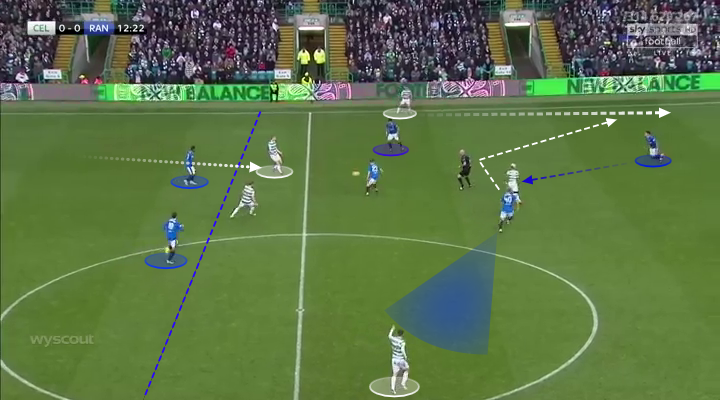 This rotation flummoxed Kranjcar whose natural instinct was to track Boyata but that left Brown spare to receive and quickly play through the lines where Armstrong could receive side on and trap while running into the channel. Celtic only managed to penetrate the Rangers right twice as the focus was to allow the ball centrally and press as soon as the ball went backwards. To counter this, Sinclair came inside more regularly to create an overload and on the 12th minute this saw Tierney released down the channel. Candeias’ blocking of the ball to Tierney meant that he was five yards higher than the full-back and so Tavernier had to be wary of the Scot galloping down the line. However, that meant a balancing act between remaining vigilant of Tierney and following Sinclair inside. He decided to let Sinclair roam so that he didn’t leave a huge gap in which to play to Tierney in but this meant that McCrorie had to split himself between both McGregor and Sinclair. Ajer’s ability to bring the ball out of defence saw Kranjcar and Morelos on the other side of the ball, which meant that Holt had to eventually leave Armstrong and confront the Norwegian. McCrorie could only leave his job of marking McGregor – who had stretched the width between the three midfielder by drifting to the right – to pick up Sinclair in the pocket when it was obvious where the pass was going. but by then it was too late. Tavernier judged that he could close the space quickly enough to deny the ball wide but by doing so he left a huge gap behind that Tierney strode into. Celtic finished the first-half strongly but their momentum didn’t carry through after the break as their play became more disjointed. There was little rhythm and Lustig’s frantic decisions while in possession characterised much of the match. Below is one example of a play he replicated about half a dozen times. As Windass presses him, Ajer steps up to offer an option in which to overcome Morelos’ attempts to read the play but he chooses the easy option of playing long without even looking at Dembele’s whereabouts. Celtic’s best chance of the game came when Tierney was able to exploit the one positional flaw on the right wing. but Foderingham made a great save to tip the ball round the post. The position Forrest received the ball in should not have been a surprise to Rangers though, as he made the exact same movement in the third minute. The winger came in off the line whenever Tierney or Sinclair were 1v1 to time his arrival at the ‘D’ with the delivery. John was hesitant to follow him in as Dembele’s natural movement is to drift off the back of the deepest centre-half, so he prioritised providing cover to Wilson. When the ball did reach the final third, Rangers pushed up as soon as McGregor or Forrest took a touch back towards goal, playing Dembele, Sinclair and Armstrong offside. 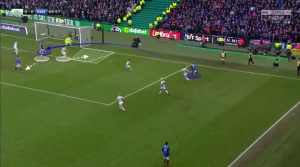 The Frenchman’s link-up play with his back to goal is something Murty was conscious of, so by denying the initial pass into feet at the edge of the box the possibility of combination play was eliminated. As half-time approached, however, Celtic did succeed in this regard as Rangers dropped deeper, a subconscious consequence of being under the cosh for a sustained period. Celtic created two big chances from set-pieces as their physical presence proved difficult for Rangers to counter. Murty opted for a pure man-marking system, but Celtic’s use of blocking nearly created a carbon copy of Dembele’s header in the 5-1 game at Parkhead last season. Tavernier was marking Dembele and Alves was on Boyata but Dembele made an arced run from the edge of the box to the back post where Armstrong’s delivery would arrive. Boyata simply stepped across Tavernier and blocked him, which would have left Dembele stepping onto a free header had Alves not managed to spot the danger and get a challenge in. Forrest acted as an obstacle to interrupt Rangers’ marking from free-kicks. Boyata was clearly the target as he drifted to the back post with Wilson but Forrest stood in an offside position only to come back as the ball was struck. He then stood his ground and from behind lent in to the Rangers player at the back of the pack of players. The sandwiched Alves between Forrest and Lustig, giving Boyata a free run at overpowering Wilson, which almost led to Dembele knocking in from the flick-down. In the first minute of the game, Declan John was able to access the final third of the park in acres of space when Danny Wilson pinged a 40-yard diagonal to escape the pressure from James Forrest. 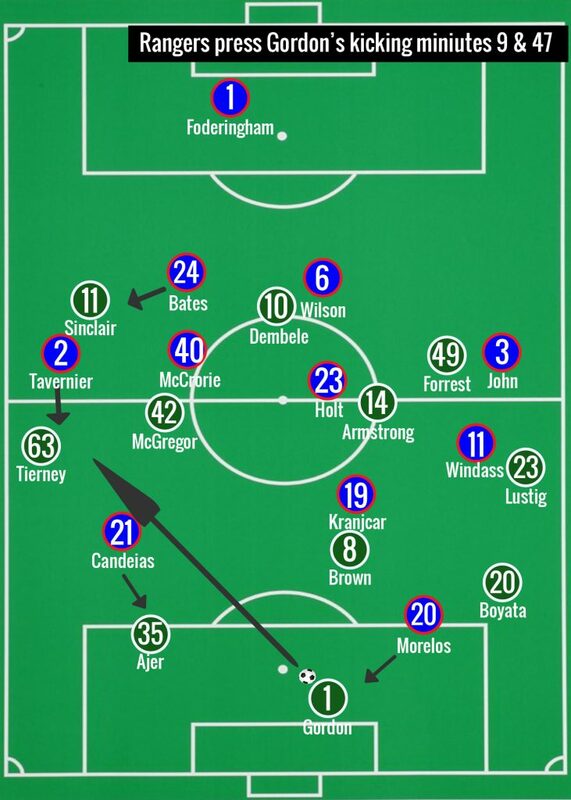 Rodgers tries to condense the park horizontally when opposition teams have the ball on the sideline – with the lack of ability to play in tight areas or switch play quickly lessening the risk – by bringing the far-side winger, Forrest, into a position just off centre. From there he is able to press the central midfielder should he try and turn out with the ball or propel onto the spare centre-half should the full-back find a gap to play behind Dembele. 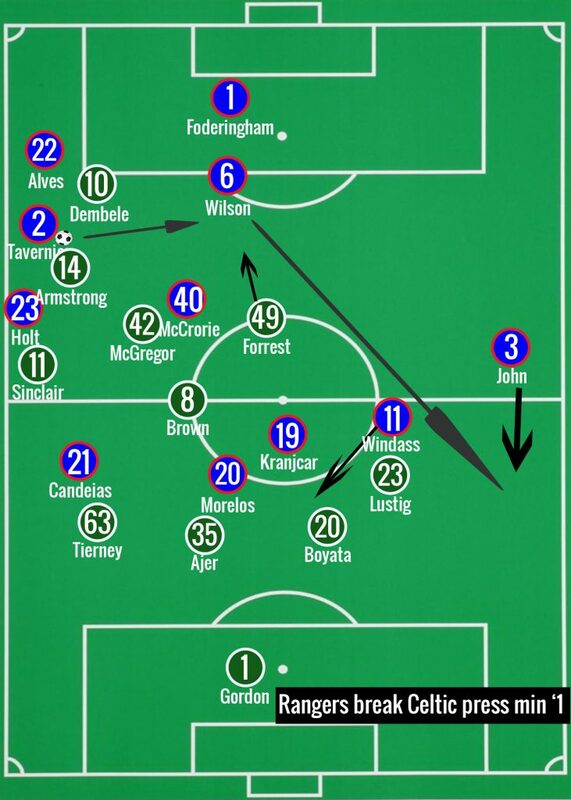 Tavernier was able to do the latter and Rangers created the extra space in front of the Welsh full-back by Windass making an aggressive run inside and Kranjcar holding a high position, which occupied both Boyata and Lustig. Rangers never replicated this play successfully again as they opted to go direct to Morelos as a default tactic even when other avenues were available. Direct play did pay dividends in the second-half, but the most success came from when the long pass was controlled through good movement elsewhere. Again, an avenue Rangers never explored enough was a series of movements they have enjoyed success with against Aberdeen, Hamilton and Partick Thistle. When a Rangers centre-half had time to edge forward with the ball, Candeias came inside to allow the pass to Tavernier but he also made a sharp movement towards the ball which vacated the channel behind him. 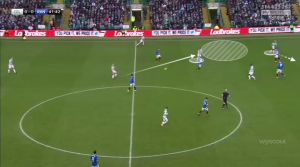 Morelos used this as the trigger to sprint across to take up the space created, with his strength making it difficult for Ajer to prevent him from getting on the end of the clipped pass over the top. It was a simple but effective way of Rangers gaining possession higher up the park without the danger of having to play through Celtic’s press. Rangers were extremely dangerous in transition after the break, with the partnership of Tavernier and Candeias causing Celtic endless problems. Tierney can be susceptible to counter attacks when the opposition leave their wide man detached from the defensive block. The first still is from the opening ten minutes when Candeias holds his position and springs a countr attack once the ball has been cleared into his path. Celtic had six players ahead of the ball but Rangers were consistently accurate with the initial pass to turn defence into attack. In the second half the emphasis on playing quickly through the lines was even more pronounced as Morelos was the target to hit, which enabled Windass and Candeias to support. Candeias again exploited the space left in the channel by Tierney and had to be cynically tripped after Morelos had played him in. Tavernier was instrumental in everything positive Rangers did and drove the side on from deep. He was able to use his pace to bomb down the line on several occasions but it was the closer spacing of is teammates that gave him options from which he could link-up with. 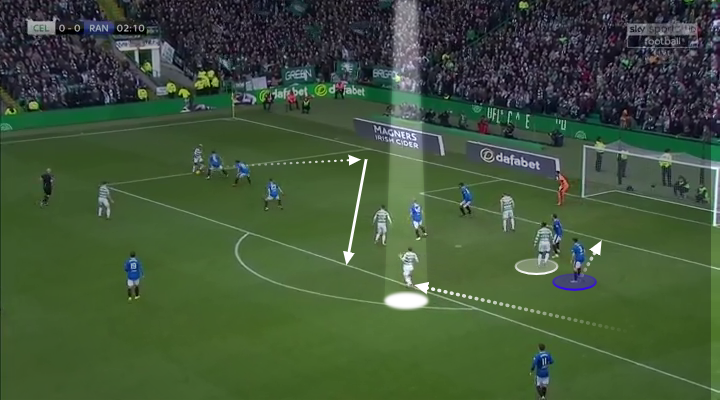 Here, the proximity of the wide player, the inside midfielder and frontman gave Tavernier several options, whereas, in the first-half the only viable option a lot of the time was to go long to Morelos. The improvement in Rangers’ possession was as much to do with a change in Celtic’s attitude as it was Rangers gaining belief. The second picture shows just how deep Celtic dropped during a twenty minute spell where Rangers created three great opportunities. The home side were slow in pushing out from their eighteen-yard box and began to lose their shape as Wilson and McCrorie mopped up second balls. Tavernier was able to receive the ball in better positions as shown in the image where he encourages McCrorie to push forward as it would force Armstrong deeper and open up the switch of play where he could take Sinclair on one v one. Ajer received many plaudits for his performance on the ball, but he struggled in the second 45 when Morelos decided to attach himself to the Norwegian The Colombian obviously believed that he could physically dominate Ajer as opposed to Boyata. He dropped deeper than he had been doing in an attempt to exploit Ajer’s lack of pace on the turn. It either worked or would have bar a poorly executed pass five times as he was able to hold off Ajer or spin him when he got too tight. Rangers’ best three chances of the game all came from crosses from the right where Celtic’s centre-back pair were found wanting. The first header shows how Ajer failed to defend the front six space as he held his position in line with the box rather than dropping to block the ball across the front post. Boyata left Morelos free as he stepped out towards Windass in anticipation of the cutback which was a grave error of judgement. The second case deals with a deeper cross where Ajer is caught square on not expecting Tavernier to take the ball on the volley. Not only does he fail to be side on, Boyata again prioritises Holt at the edge of the box and maintains a position marginally higher than Ajer when he should have been providing cover.